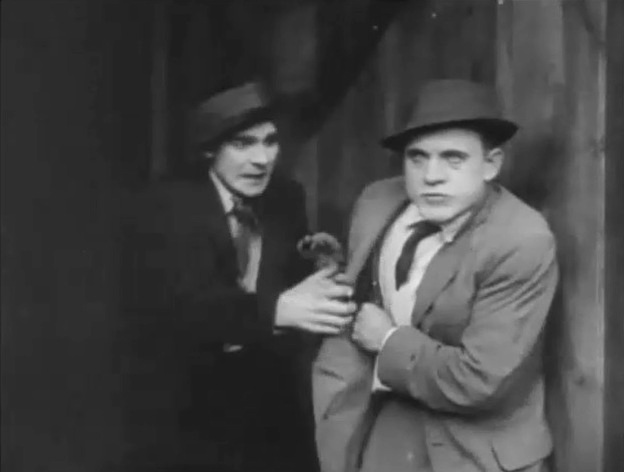 "The Musketeers of Pig Alley" is a short crime drama directed by D. W. Griffith. This film illustrates the work of actor Robert Harron and cinematographer Billy Bitzer, stars of Silent Hall of Fame. 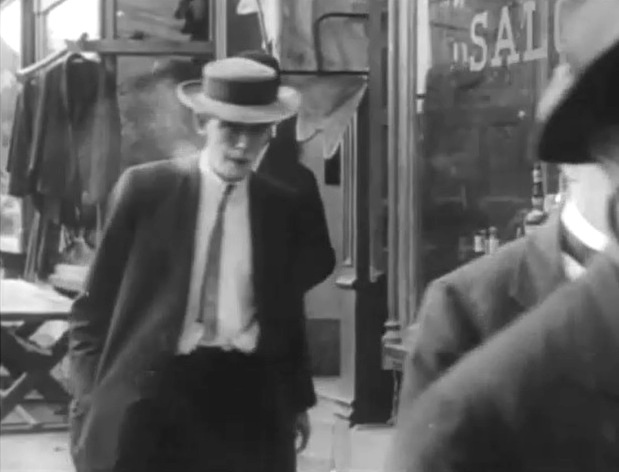 "The Musketeers of Pig Alley" is the first gangster film in history. It has some excellent acting by a very strong cast and a lot of suspense. The film is also a predecessor of what would become known a quarter of a century later as "the film noir". Lillian Gish plays The Little Lady, whose husband is a musician and has to leave town for work. In his absence she has to rebuff the advances of a cocky character by the nickname of Snapper Kid (Elmer Booth), the gang leader of the Musketeers. When her sick mother dies The Little Lady becomes grief-stricken. One day she is visited by a friend who takes her to a dance party to raise her spirits. The Little Lady is invited for a drink by some fellow, who puts a drug in her glass, but she is saved by Snapper Kid. As it turns out, the other guy is the rival gang's leader. The two bosses square off, but decide to settle the dispute outside. Suspense builds up as the two rival gangs chase each other around Pig Alley. Will there be a winner, or will all perish or go to jail? Lillian Gish is not happy that Walter Miller has to leave her for work in "The Musketeers of Pig Alley" (1912), directed by D. W. Griffith, cinematographer Billy Bitzer. Lillian Gish passes by Dorothy Gish in "The Musketeers of Pig Alley" (1912), directed by D. W. Griffith, cinematographer Billy Bitzer. 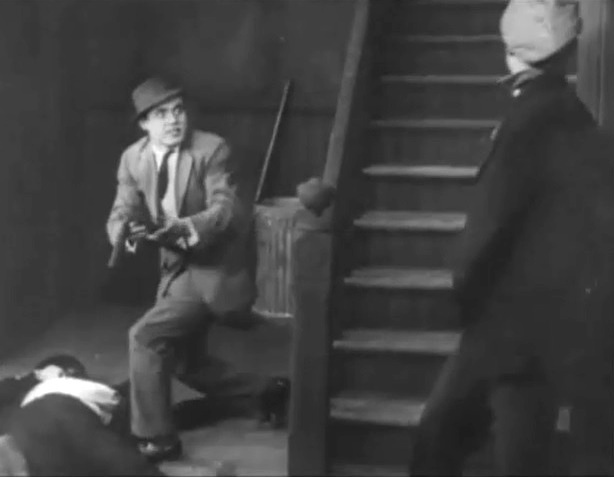 Elmer Booth knocks down Walter Miller and steals his wallet in "The Musketeers of Pig Alley" (1912), directed by D. W. Griffith, cinematographer Billy Bitzer. 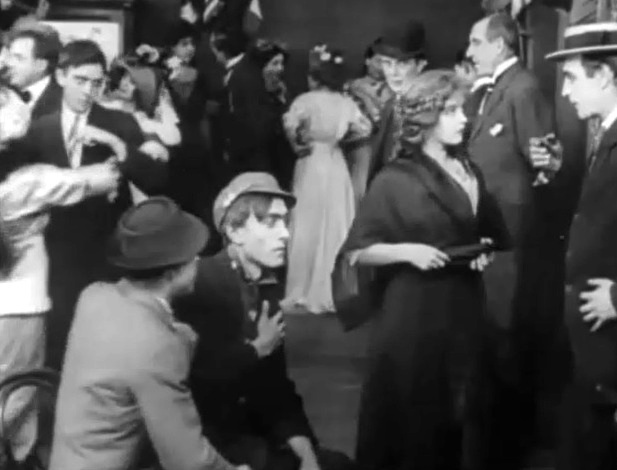 Lillian Gish talks to Alfred Paget as Robert Harron can be seen dancing in "The Musketeers of Pig Alley" (1912), directed by D. W. Griffith, cinematographer Billy Bitzer. 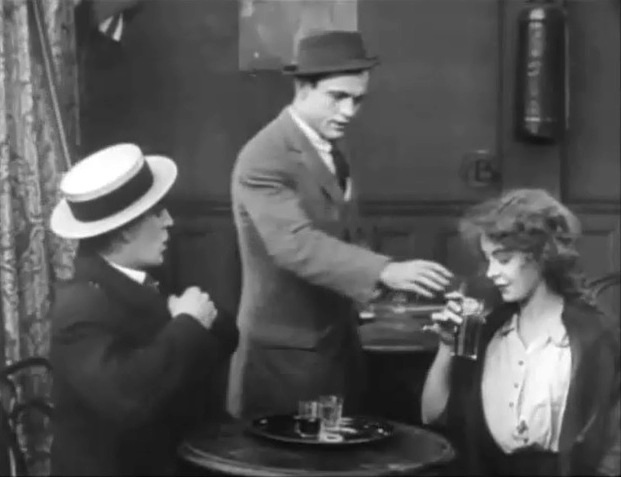 Lillian Gish is distracted as Alfred Paget puts a drug in her drink with Elmer Booth watching in "The Musketeers of Pig Alley" (1912), directed by D. W. Griffith, cinematographer Billy Bitzer. 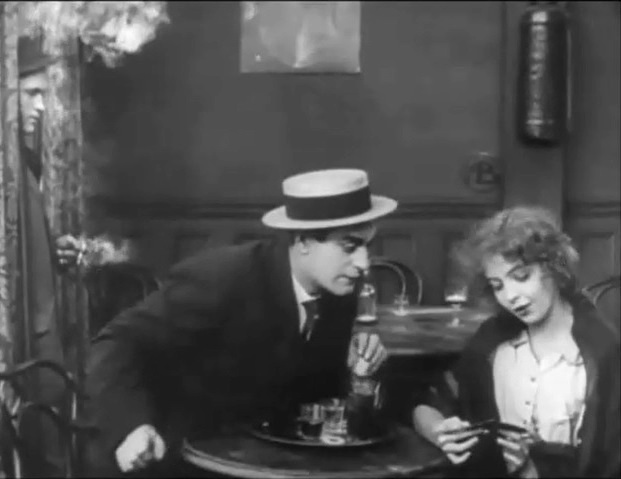 Lillian Gish is stopped by Elmer Booth from having that drugged drink in "The Musketeers of Pig Alley" (1912), directed by D. W. Griffith, cinematographer Billy Bitzer. 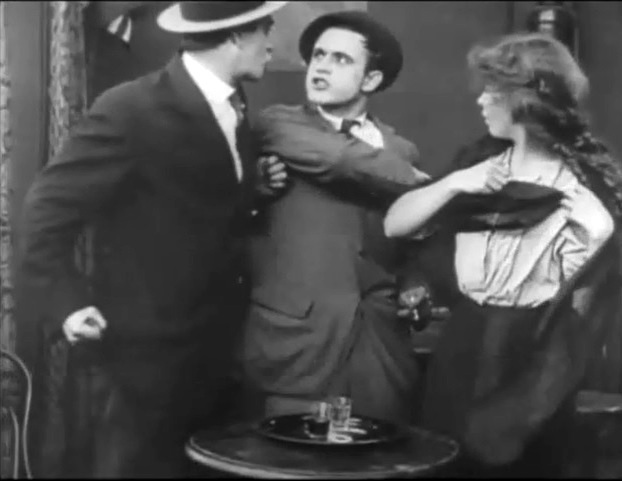 Lillian Gish looks on as Alfred Paget and Elmer Booth have a scuffle in "The Musketeers of Pig Alley" (1912), directed by D. W. Griffith, cinematographer Billy Bitzer. Alfred Paget and Elmer Booth square off in "The Musketeers of Pig Alley" (1912), directed by D. W. Griffith, cinematographer Billy Bitzer. 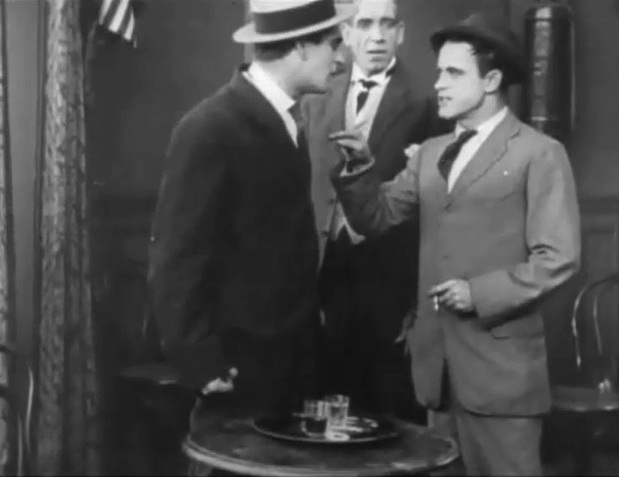 Elmer Booth looks at the rival gang with Robert Harron in the middle in "The Musketeers of Pig Alley" (1912), directed by D. W. Griffith, cinematographer Billy Bitzer. 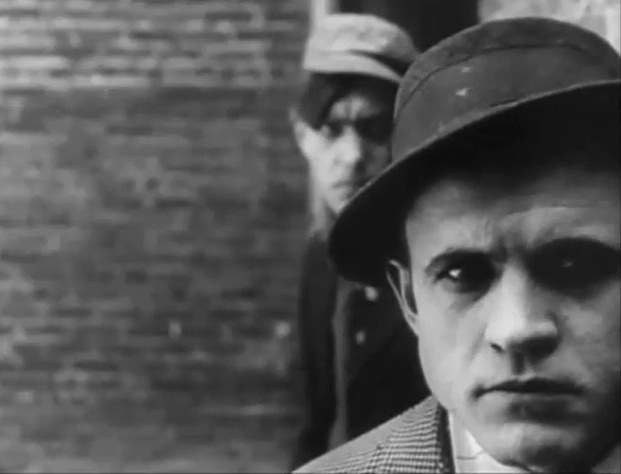 Robert Harron takes a log look at the rival gang as it leaves in "The Musketeers of Pig Alley" (1912), directed by D. W. Griffith, cinematographer Billy Bitzer. 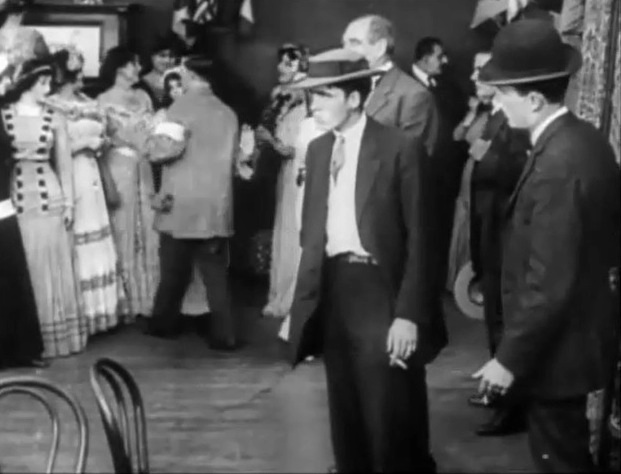 Elmer Booth checks his gun in "The Musketeers of Pig Alley" (1912), directed by D. W. Griffith, cinematographer Billy Bitzer. 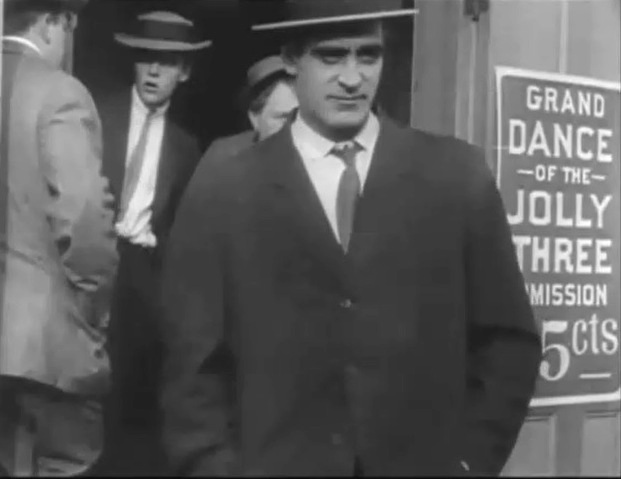 Robert Harron follows his gang leader in "The Musketeers of Pig Alley" (1912), directed by D. W. Griffith, cinematographer Billy Bitzer. 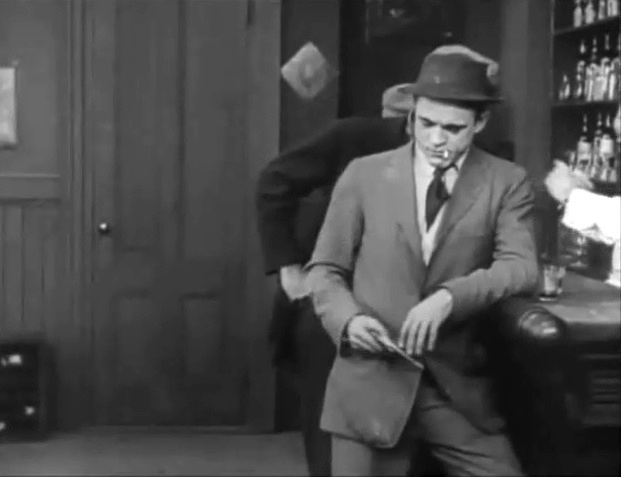 Robert Harron is ready for a fight holding a gun in his pocket in "The Musketeers of Pig Alley" (1912), directed by D. W. Griffith, cinematographer Billy Bitzer. 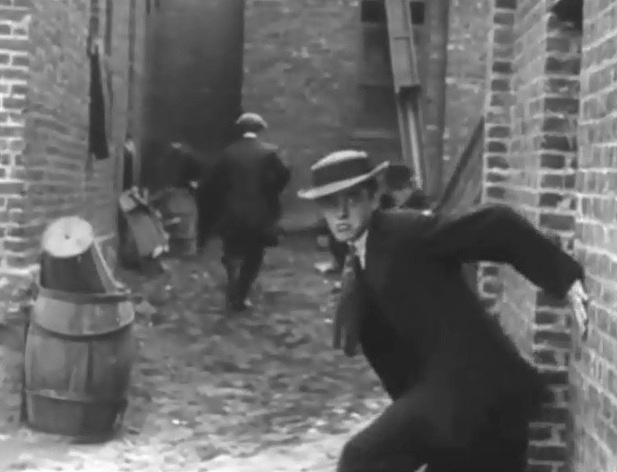 Elmer Booth chases the enemy in a classic film noir image in "The Musketeers of Pig Alley" (1912), directed by D. W. Griffith, cinematographer Billy Bitzer. 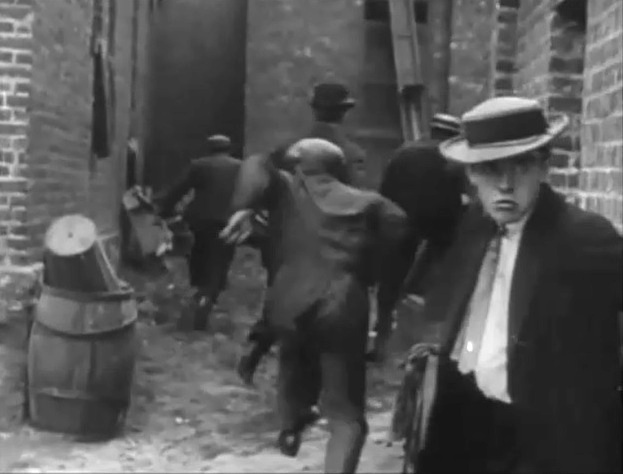 Robert Harron covers his comrades as his gang retreats in "The Musketeers of Pig Alley" (1912), directed by D. W. Griffith, cinematographer Billy Bitzer. 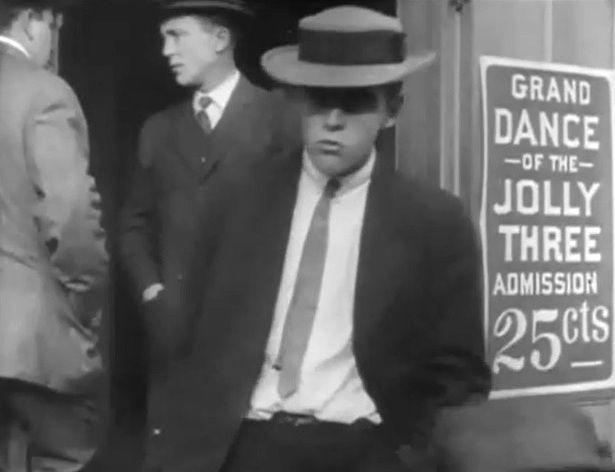 Robert Harron is the last to retreat and look for cover in "The Musketeers of Pig Alley" (1912), directed by D. W. Griffith, cinematographer Billy Bitzer. 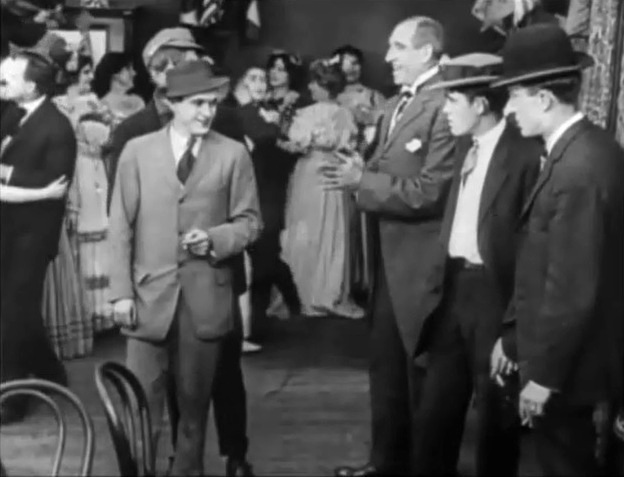 Elmer Booth is surprised by Walter Miller, who recovers his wallet in "The Musketeers of Pig Alley" (1912), directed by D. W. Griffith, cinematographer Billy Bitzer. Lillian Gish is thrilled that Walter Miller recovered the money in "The Musketeers of Pig Alley" (1912), directed by D. W. Griffith, cinematographer Billy Bitzer. Lillian Gish and Walter Miller are not impressed when Elmer Booth asks for alibi in "The Musketeers of Pig Alley" (1912), directed by D. W. Griffith, cinematographer Billy Bitzer. 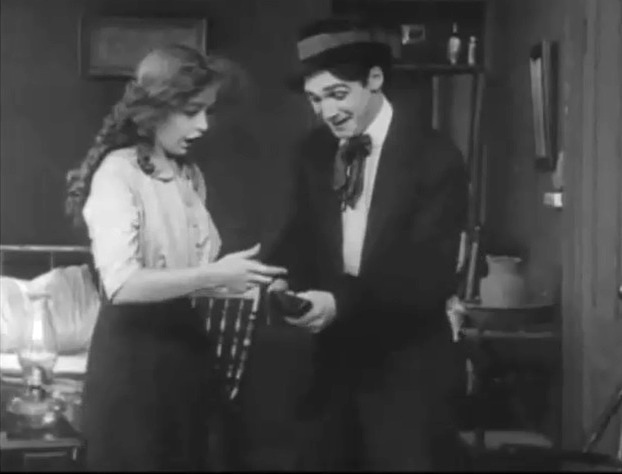 Elmer Booth reminds Lillian Gish that he saved her from the drugged drink in "The Musketeers of Pig Alley" (1912), directed by D. W. Griffith, cinematographer Billy Bitzer. Lillian Gish provides an alibi for Elmer Booth in "The Musketeers of Pig Alley" (1912), directed by D. W. Griffith, cinematographer Billy Bitzer.